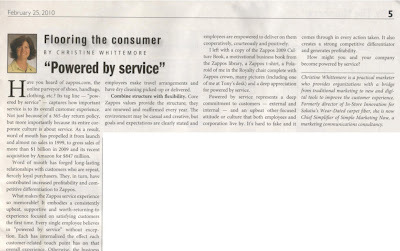 Flooring The Consumer: Customer Experience "Powered By Service"
Customer Experience "Powered By Service"
This article titled "Powered by service" about service and the customer experience was inspired by my visit to online retailer Zappos in early 2010. It appeared in the February 25th, 2010 issue of Floor Covering Weekly. Have you heard of Zappos.com, the online purveyor of shoes, handbags and now clothing, etc.? Their tagline - “powered by service” – captures how important service is to their overall customer experience. Not just because of a 365-day return policy [with free return shipping], but more importantly because their entire corporate culture is about service. As a result, word of mouth has propelled them from launch and almost no sales in 1999, to gross sales of $8.6 million in 2001, $32 million in 2002, more than $1 billion in 2009 and their recent acquisition by Amazon for $847 million. Note the reference to ‘word-of-mouth’ rather than traditional advertising in driving growth. WOM has forged long-lasting relationships with customers who are repeat, fiercely loyal purchasers. They, in turn, have contributed increased profitability and competitive differentiation to Zappos. 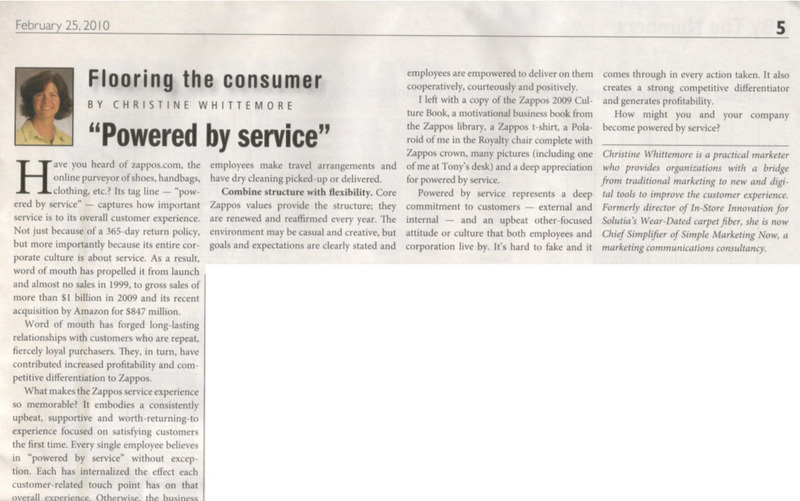 What makes the Zappos service experience so memorable? It embodies a consistently upbeat, supportive and worth-returning-to experience focused on satisfying customers the first time. Every single employee believes in “powered by service” without exception. Each has internalized the effect each customer-related touchpoint, direct or indirect, has on that overall experience. Otherwise, the business model falls apart. Zappos hires people for cultural fit, looking for commitment to 10 core values that employees re-interpret on a yearly basis. Zappos culture is as much internally as it is externally focused. Based on positive psychology, happiness and satisfaction are a function of how much control and progress an employee perceives s/he has, how connected s/he feels to the organization and whether s/he is part of something greater than the individual. Anyone who doesn’t buy in is encouraged to leave within the first few weeks rather than risk cultural mismatch. While at Surfaces, I toured Zappos.com headquarters – something anyone can do; simply go online and make a reservation – to experience the legendary, even extreme customer service oriented Zappos culture and meet the people of Zappos. From Zack who picked me up to Pam who led my solo tour and the many people in between, I encountered the real ‘powered by service’ deal: authentically passionate individuals committed to the company’s success and to customers’ delight. Here’s how you might bring ‘powered by service’ to your organization. It starts at the top. Zappos CEO Tony Hsieh routinely answers customer service calls. He actively monitors and interacts on Twitter, the micro-blogging platform, listening to customers. He is easily accessible: you will find no offices, only workstations and conference rooms. Show employees you care; make employees’ lives easier so they can focus 110%+ on delivering service. The Zappos reception area is more like a concierge desk where employees make travel arrangements and have dry cleaning picked-up or delivered. Have a package to receive or send out? Do so from Zappos. Working the night shift and need a nap? There’s a place for that. Hungry? Zappos offers free meals. Need financial or nutritional advice? Meet with a consultant. Feeling down and losing focus as an organization? Count on a motivational speaker to put things back into perspective. Combine structure with flexibility. Core Zappos values provide the structure; they are renewed and reaffirmed every year. The environment may be casual and creative, but goals and expectations are clearly stated and employees are empowered to deliver on them cooperatively, courteously and positively. ‘Powered by Service’ is a collaborative process. Everyone at Zappos goes through cross training to better understand the company and how each other’s role affects others’. Cross training makes it easier to help out during crunch times. I left with a copy of the Zappos 2009 Culture Book, a motivational business book [The 4-Hour Workweek] from the Zappos library, a Zappos t-shirt, a Polaroid of me in the Royalty chair complete with Zappos crown [which doubles up as a foot sizer], many pictures [including one of me at Tony’s desk] and a deep appreciation for ‘powered by service’. ‘Powered by service’ represents a deep commitment to customers – external and internal – and an upbeat other-focused attitude or culture that both employees and corporation live by. It’s hard to fake and it comes through in every action taken. It also creates a strong competitive differentiator and generates profitability. How might you and your company become 'powered by service'? James, thank you. Your post is a wonderful addition to that second step. It reminds us that, as good as we may think we are, we really can't succeed unless we start with our employees. Great article. I think your first point is key regarding engagement of top executives. Even if C-level executives aren't answering customer service calls at most companies, any connection they can make with the customer base, employees or employee groups can keep the company's service to its customers and employees relevant. Kimberly, great point! The more C-level executives are involved and demonstrate their total commitment to service, the better the entire organization can make that commitment come to life. This is really an interesting write-up. Among the four(4) factors that might bring ‘powered by service’ to our organization, "Its starts at the top" is the most important one. Because as a leader, you should be the model of all of your employee. You should take your stand and lead the company where you think it'll succeed. Danielle, I agree. Unless there is that support from the top, it's hard to infuse the service DNA into every single employee. Thanks for sharing your take on this subject. James, this is a marvelous link. Thanks for sharing it! I love the term "powered by service," and I think there's consensus such a philosophy needs to start at the top... but when a front-line employee wants to convince the top of their company to shift toward this goal, how could he or she go about motivating that shift? Glenn, the best way is to come up with small success stories and build on those. Ideally, the company's culture will support the shift. What have you found works best?